Two countries, two universities and two degrees equals one global citizen. Deney Augustine Joseph completed three years of a Bachelor of Science in Agriculture at Annamalai University in India and traveled to Dalhousie University’s Faculty of Agriculture in Canada where he also completed a Bachelor of Technology in Environmental Landscape Horticulture. “To me, it was a great opportunity to explore globalization,” he says. And explore he did. Deney was the first recipient of the Global Citizenship Impact Award this past March. The award recognizes a student who has demonstrated an active commitment to internationalization of the campus, promotion of multiculturalism, pursuit of social justice and civic engagement locally and outside the campus community. A well-respected peer educator, Deney has dedicated his energy to ensuring that others are comfortable and confident when learning about positive and healthy lifestyles. He is sincerely committed to helping others in his community and is an active participant in the Faculty’s student leadership program, SAIL, has served on the International Student’s Association and is a PROsocial peer educator. 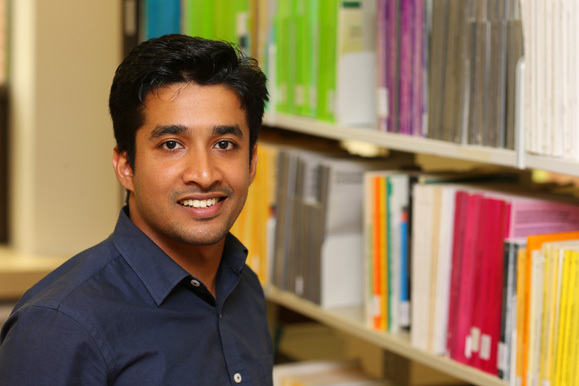 Growing up in a farming family in Kerala, India influenced Deney’s career path. “I grew up on a farm where we grow plantation crops such as coconut, rubber trees, cocoa and other spices,” he explained. “It influenced me to get into the field of Agriculture and it was here that I found my interest in entomology,” he added. Courses such as Residential Landscape Design, Turfgrass Production and Management, Landscape Horticulture, Urban Tree Management, Landscape Design and Construction, Horticultural Therapy, Project Management and Geographical Information System in the Environmental Sciences department further solidified his decision. Deney completed his undergraduate degree at the Faculty of Agriculture and is currently pursuing his Masters of Science in the field of Entomology under the supervision of Dr. Chris Cutler. Deney plans to pursue a career in agricultural research and hopes to return to his family farm in India. Check out more about our Environmental Landscape Horticulture program at the Faculty of Agriculture. Interested in taking your Masters of Science like Deney? View our Graduate Studies page for more information.